The hour of dinner has been said, by Dr. Johnson, to be the most important hour in civilized life. 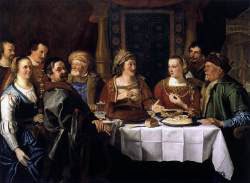 The etiquette of the dinner-table has a prominence commensurate with the dignity of the ceremony. Like the historian of Peter Bell, we commence at the commencement, and thence proceed to the moment when you take leave officially, or vanish unseen. In order to dine, the first requisite is—to be invited. The length of time which the invitation precedes the dinner is always proportioned to the grandeur of the occasion, and varies from two days to two weeks. To an invitation received less than two days in advance, you will lose little by replying in the negative, for as it was probably sent as soon as the preparations of the host commenced, you may be sure that there will be little on the table fit to eat. Those abominations, y’clept “plain family dinners,” eschew like the plague. You reply to a note of invitation immediately, and in the most direct and unequivocal terms. If you accept, you arrive at the house rigorously at the hour specified. It is equally inconvenient to be too late and to be too early. If you fall into the latter error, you find every thing in disorder; the master of the house is in his dressing-room, changing his waistcoat; the lady is still in the pantry; the fire not yet lighted in the parlor. If by accident or thoughtlessness you arrive too soon, you may pretend that you called to inquire the exact hour at which they dine, having mislaid the note, and then retire to walk for an appetite. If you are too late, the evil is still greater, and indeed almost without a remedy. Your delay spoils the dinner and destroys the appetite and temper of the guests; and you yourself are so much embarrassed at the inconvenience you have occasioned, that you commit a thousand errors at table. If you do not reach the house until dinner is served, you had better retire to a restaurateurs, and thence send an apology, and not interrupt the harmony of the courses by awkward excuses and cold acceptances. When the guests have all entered, and been presented to one another, if any delay occurs, the conversation should be of the lightest and least exciting kind; mere common-places about the weather and late arrivals. You should not amuse the company by animated relations of one person who has just cut his throat from ear to ear, or of another who, the evening before, was choked by a tough beef-steak and was buried that morning. When dinner is announced, the inviter rises and requests all to walk to the dining-room. He then leads the way, that they may not be at a loss to know whither they should proceed. Each gentleman offers his arm to a lady, and they follow in solemn order. The great distinction now becomes evident between the host and the guests, which distinction it is the chief effort of good breeding to remove. To perform faultlessly the honors of the table, is one of the most difficult things in society: it might indeed be asserted without much fear of contradiction, that no man has as yet ever reached exact propriety in his office as host, has hit the mean between exerting himself too much and too little. His great business is to put every one entirely at his ease, to gratify all his desires, and make him, in a word, absolutely contented with men and things. To accomplish this, he must have the genius of tact to perceive, and the genius of finesse to execute; ease and frankness of manner; a knowledge of the world that nothing can surprise; a calmness of temper that nothing can disturb, and a kindness of disposition that can never be exhausted. When he receives others, he must be content to forget himself; he must relinquish all desire to shine, and even all attempts to please his guests by conversation, and rather, do all in his power to let them please one another. He behaves to them without agitation, without affectation; he pays attention without an air of protection; he encourages the timid, draws out the silent, and directs conversation without Sustaining it himself. He who does not do all this, is wanting in his duty as host; he who does, is more than mortal. When all are seated, the gentleman at the head of the table sends soup to every one, from the pile of plates which stand at his right hand. He helps the person at his right hand first, and at his left next, and so through the whole. There are an immensity of petty usages at the dinner table, such as those mentioned in the story of the Abb, Delille and the Abb, Cossen in the Introduction to this volume, which it would be trifling and tedious to enumerate hers, and which will be learned by an observing man after assisting at two or three dinners. You should never ask a gentleman or lady at the table to help you to any thing, but always apply to the servants. Your first duty at the table is to attend to the wants of the lady who sits next to you, the second, to attend to your own. In performing the first, you should take care that the lady has all that she wishes, yet without appearing to direct your attention too much to her plate, for nothing is more ill-bred than to watch a person eating. If the lady be something of a gourmande, and in ever-zealous pursuit of the aroma of the wing of a pigeon, should raise an unmanageable portion to her mouth, you should cease all conversation with her, and look steadfastly into the opposite part of the room. In France, a dish, after having been placed upon the table for approval, is removed by the servants, and carved at a sideboard, and after. wards handed to each in succession. This is extremely convenient, and worthy of acceptation in this country. But unfortunately it does not as yet prevail here. Carving therefore becomes an indispensable branch of a gentleman’s education. You should no more think of going to a dinner without a knowledge of this art, than you should think of going without your shoes. The gentleman of the house selects the various dishes in the order in which they should be cut, and invites some particular one to perform the office. It is excessively awkward to be obliged to decline, yet it is a thing too often occurring in this country. When you carve, you should never rise from your seat. Some persons, in helping their guests, or recommending dishes to their taste, preface every such action with an eulogy on its merits, and draw every bottle of wine with an account of its virtues. Others, running into the contrary extreme, regret or fear that each dish is not exactly as it should be; that the cook, etc., etc. Both of these habits are grievous errors. You should leave it to your guests alone to approve, or suffer one of your intimate friends who is present, to vaunt your wine. When you draw a bottle, merely state its age and brand, and of what particular vintage it is. Do not insist upon your guests partaking of particular dishes, never ask persons more than once, and never put anything by force upon their plates. It is extremely ill-bred, though extremely common, to press one to eat of anything. You should do all that you can to make your guests feel themselves at home, which they never can do while you are so constantly forcing upon their minds the recollection of the difference between yourself and them. You should never send away your own plate until all your guests have finished. Before the cloth is removed you do not drink wine unless with another. If you are asked to take wine it is uncivil to refuse. When you drink with another, you catch the person’s eye and bow with politeness. It is not necessary to say anything, but smile with an air of great kindness. Some one who sits near the lady of the house, should, immediately upon the removal of the soup, request the honor of drinking wine with her, which movement is the signal for all the others. If this is not done, the master of the house should select some lady. He never asks gentlemen, but they ask him; this is a refined custom, attended to in the best company. If you have drunk with every one at the table, and wish more wine, you must wait till the cloth is removed. The decanter is then sent round from the head of the table, each person fills his glass, and all the company drinks the Health of all the company. It is enough if you bow to the master and mistress of the house, and to your opposite neighbor. After this the ladies retire. Some one rises to open the door for them, and they go into the parlor, the gentlemen remaining to drink more wine. After the ladies have retired, the service of the decanters is done. The host draws the bottles which have been standing in a wine cooler since the commencement of the dinner. The bottle goes down the left side and up the right, and the same bottle never passes twice. If you do not drink, always pass the bottle to your neighbor. At dinner never call for ale or porter; it is coarse, and injures the taste for wine. A gentleman should always express his preference for some one sort of wine over others; because, as there is always a natural preference for one kind, if you say that you are indifferent, you show that you are not accustomed to drink wines. Your preference should not of course be guided by your real disposition; if you are afflicted by nature with a partiality for port, you should never think of indulging it except in your closet with your chamber-door locked. The only index of choice is fashion;--either permanent fashion (if the phrase may be used), or some temporary fashion created by the custom of any individual who happens to rule for a season in society. Port was drunk by our ancestors, but George the Fourth, upon his accession to the regency, announced his royal preference for sherry. It has since been fashionable to like sherry. This is what we call a permanent fashion. Champagne wine is drunk after the removal of the first cloth; that is to say, between the meats and the dessert. One servant goes round and places before each guest a proper-shaped glass; another follows and fills them, and they are immediately drunk. Sometimes this is done twice in succession. The bottle does not again make its appearance, and it would excite a stare to ask at a later period for a glass of champagne wine. If you should happen to be blessed with those rely nuisances, children, and should be entertaining company, never allow them to be brought in after dinner, unless they are particularly asked for, and even then it is better to say they are at school. Some persons, with the intention of paying their court to the father, express great desire to see the sons; but they should have some mercy upon the rest of the party, particularly as they know that they themselves would be the most disturbed of all, if their urgent entreaty was granted. Never at any time, whether at a formal or a familiar dinner party, commit the impropriety of talking to a servant: nor ever address any remark about one of them to one of the party. Nothing can be more ill-bred. You merely ask for what you want in a grave and civil tone, and wait with patience till your order is obeyed. It is a piece of refined coarseness to employ the fingers instead of the fork to effect certain operations at the dinner table, and on some other similar occasions. To know how and when to follow the fashion of Eden, and when that of more civilized life, is one of the many points which distinguish a gentleman from one not a gentleman; or rather, in this case, which shows the difference between a man of the world, and one who has not “the tune of the time.” Cardinal Richelieu detected an adventurer who passed himself off for a nobleman, by his helping himself to olives with a fork. He might have applied the test to a vast many other things. Yet, on the other hand, a gentleman would lose his reputation, if he were to take up a piece of sugar with his fingers and not with the sugar-tongs. It is of course needless to say that your own knife should never be brought near to the butter, or salt, or to a dish of any kind. If, however, a gentleman should send his plate for anything near you, and a knife cannot be obtained immediately, you may skillfully avoid all censure by using his knife to procure it. When you send your plate for anything, you leave your knife and fork upon it, crossed. When you have done, you lay both in parallel lines on one side. A render who occupies himself about greater matters, may smile at this precept. It may, indeed, be very absurd, yet such is the tyranny of custom, that if you were to cross your knife and fork when you have finished, the most reasonable and strong-minded man at the table could not help setting you down, in his own mind, as a low-bred person. Magis sequor quam probo. Some persons, who cannot draw the nice distinction between too much and too little, desiring to be particularly respectable, make a point of appearing unconcerned and quite indifferent to enjoyment at dinner. Such conduct not only exhibits a want of sense and a profane levity, but is in the highest degree rude to your obliging host. He has taken a great deal of trouble to give you pleasure, and it is your business to be, or at least to appear, pleased. It is one thing, indeed, to stare and wonder, and to ask for all the delicacies on the table in the style of a person who had lived all his life behind a counter, but it is quite another to throw into your manner the spirit and gratified air of a man who is indeed not unused to such matters, but who yet esteems them at their fall value. After the wine is finished, you retire to the drawing-room, where the ladies are assembled; the master of the house rising first from the table, but going out of the room last. If you wish to go before this, you must vanish unseen. We conclude this chapter by a word of important counsel to the host:--Never make an apology. This is taken from The Laws of Etiquette.